So I have finally managed to get a few pictures of our newly renovated spare room up here! (Well I say newly….ahem). Anyway, better late than never, and thank you to those people on Instagram who reminded me that I said I would do a blog post about it! 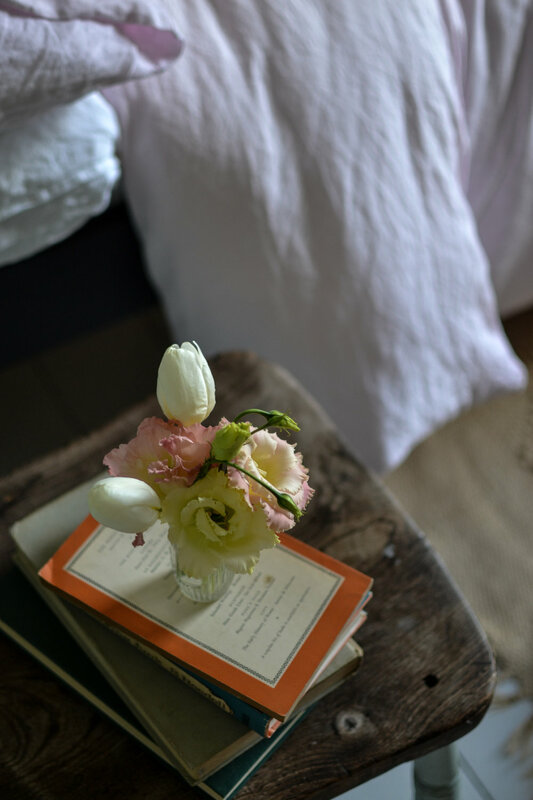 Our rather petite spare room works hard hosting regular visitors and it was feeling quite sad and neglected so needed a bit of love and thought injected into it. When we moved into this house about 4 years ago we painted the room in cheap white emulsion and sanded and painted the floorboards in Farrow & Ball Ammonite (a very soft grey that I really love). Since then we haven’t done much except for replacing the window and putting up a peg rail and book shelf above the door, both of which were cheap but very useful additions that have provided much needed storage. I knew I wanted to go for a strong colour in here as it is a small room and the white we had previously was looking grubby and bland. 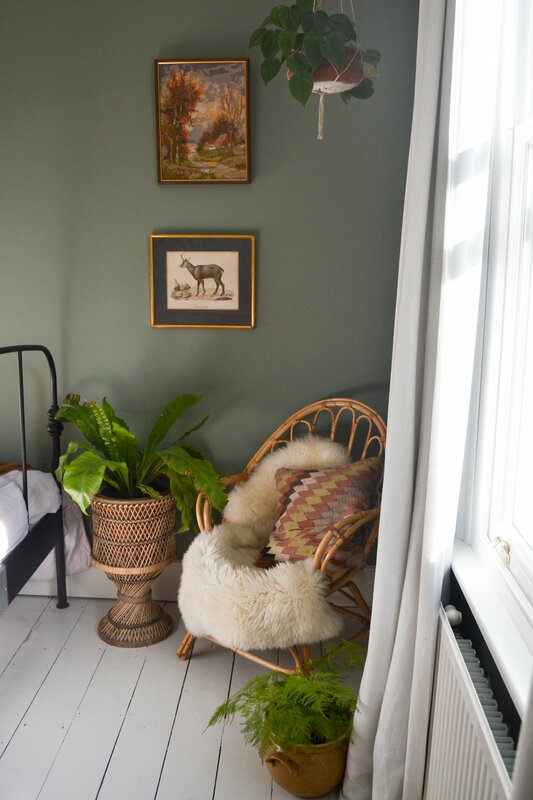 I became totally obsessed with the idea of a combination of teal walls with soft pink bedding so I eventually chose the lovely Card Room Green from Farrow & Ball which is a rich and strong grey-green, quite masculine and traditional. It compliments the soft grey floor and the white woodwork makes it pop. The wall colour is very dark and moody in low light but softer and calmer when the sun shines (which it does a lot in this south facing room). To counterbalance the robust colour, I set about softening the room with lots of textural accents - rumpled linen bedding in soft pink and mustard (from Piglet in Bed (gifted) and H&M Home and handmade cushions in woven fabric, vintage floral fabric and linen dyed using avocado stones and eucalyptus (take a look at my blog post here for some inspiration). 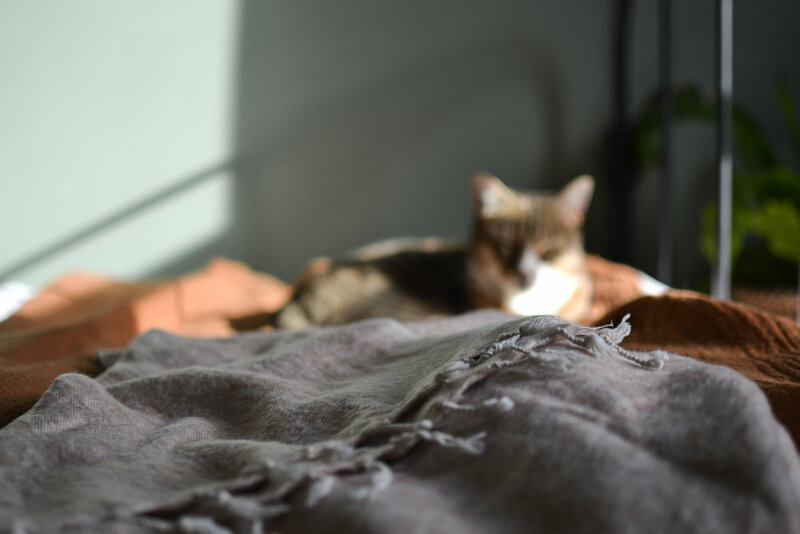 I layered the bed with a rust coloured crinkled cotton throw from H&M home (this one) and a soft pink wool blanket that was a present from my sister from Nepal. On the floor I laid a jute rug (originally from Baileys Home) that we were using in another room and a shaggy sheepskin (from this lovely company) to bring some warmth and texture to the floor. The curtains are white Lenda drapes from Ikea that we had backed with black-out material. I didn’t buy any new furniture for this room as I wanted to keep the budget to a minimum. I therefore used the furniture that we already had. Apart from the bed (which is from Ikea, now discontinued), all the furniture is second hand. The antique pine chest of drawers was a £50 find from Ebay, the wicker chair was another Ebay find (think I paid about £25 for it) and the bedside chair was from an antiques shop in Wales and cost about £10. The wicker lampshade was from Ebay (about £15). We got a local carpenter to make the shelf above the door, and I found another carpenter online to make me the peg rail with shelf above it (I think it cost about £120). The vintage suitcase was a car boot find and cost £15. When my sister was living with us and this was her bedroom it had a wardrobe, chest of drawers, ladder shelf and bedside table in it, and it felt quite full so I was keen to simplify it and gain a bit more space. We gave away the wardrobe and moved the bedside table elsewhere in the house. I repositioned the bed against the back wall which is a better use of the space, and means that you can lie in bed and look out of the window which I love. The peg rail provides ample space for guests to hang their clothes and bags and I emptied a couple of drawers in the chest of drawers too for guests to store their stuff there too. I used an old chair as a bedside table, with a very simple hanging pendant lamp above it (from here). I chose a jute cord to fit with the natural materials used elsewhere. Plants dotted around add life and texture, and their jewel green leaves look beautiful against the moody green walls. Vintage botanical prints and mid century floral pictures (an obsession of mine) (collected over the years from Ebay and local second hand shops and markets) also soften the room and add femininity and interest. The peg rail shelf is the perfect place to display other prints and pictures, trinkets and vintage earthenware and it is easy to swap and change things to keep the room evolving and feeling fresh. A sheepskin covered 1970s wicker chair in the corner creates a separate cosy space for guests to read and relax. Have you overhauled any of the rooms in your house recently?